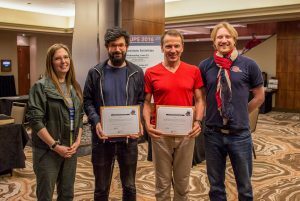 SOUPS ’16 paper on the prevalence of snooping on mobile phones has received Distinguished Paper award. The paper reports a series of quantitative studies that allowed a more accurate measurement of this phenomena. The study was led by our collaborators at the University of Lisbon. It was inspired by our previous study presented at Mobile CHI ’13. Through an anonymity-preserving survey experiment, we quantify the pervasiveness of snooping attacks, deﬁned as “looking through someone else’s phone without their permission.” We estimated the 1-year prevalence to be 31% in an online participant pool. Weighted to the U.S. population, the data indicates that 1 in 5 adults snooped on at least one other person’s phone, just in the year before the survey was conducted. We found snooping attacks to be especially prevalent among young people, and among those who are themselves smartphone users. In a follow-up study, we found that, among smartphone users, depth of adoption, like age, also predicts the probability of engaging in snooping attacks. In particular, the more people use their devices for personal purposes, the more likely they are to snoop on others, possibly because they become aware of the sensitive information that is kept, and how to access it. These ﬁndings suggest that, all else remaining equal, the prevalence of snooping attacks may grow, as more people adopt smartphones, and motivate further eﬀort into improving defenses. For more details, read the paper.